This festschrift celebrates the accomplishments of renowned social scientist Irving Louis Horowitz as he turned sixty-five. Since Horowitz's views were global and his discourse was never restricted to national boundaries, the volume includes contributions from across the globe. Collectively, the book represents a personal as well as an intellectual statement from the contributors, as each one was a friend and colleague of Horowitz. The life span of Horowitz's ideas stretches across boundaries, many which are focused on in The Democratic Imagination. 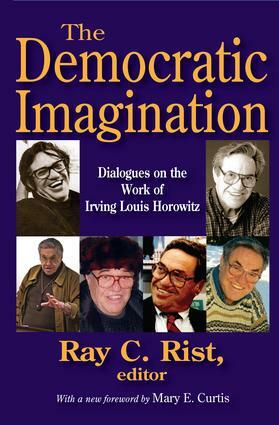 The twenty-seven essays address Horowitz's work, ideas, and influence. Horowitz was well known for his analysis of the situation in Cuba, disarray in American sociology, the impacts of technology on the publishing industry, and policy-making in the post-Cold-War era. Contributions also take note of Horowitz's involvement in diverse areas: his work with Robert Kennedy; Radio Marti; the United States General Accounting Office, and his efforts on behalf of the freedom of the press. In a final section, Horowitz responds to each of the contributors. This work, celebrating one of the most esteemed social scientists of the twentieth century, acknowledges his manifold contributions to the multiple areas in which he worked.